Johor Bahru City (Malaysia) – December 21, 2017 (travelindex.com) – InterContinental Hotels Group (IHG), one of the world’s leading hotel companies, has signed a management agreement with SKS Hotel Residences and Resorts Sdn. Bhd., a member of SKS Group, to debut the Holiday Inn brand in the capital of Johor, Malaysia, with the new 318-room Holiday Inn Johor Bahru City Centre. With its flagship location in the city’s downtown core just 30 kilometres away from the Senai International Airport, the hotel will offer convenient access to international travellers, while visitors from neighbouring Singapore will appreciate the excellent pedestrian connectivity to the Customs, Immigration and Quarantine Complex (CIQ), as well as its strategic proximity to the upcoming Singapore-Johor Bahru Rapid Transit System (RTS) linking Johor Bahru to Woodlands in Singapore. 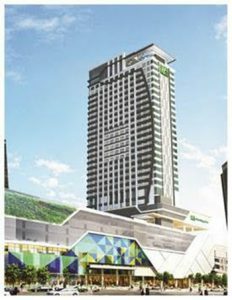 Holiday Inn Johor Bahru City Centre will be part of the Komtar JBCC mixed-use development comprising retail and commercial office spaces. Situated a stone’s throw away from two of Johor Bahru’s most popular malls – Komtar JBCC and Johor Bahru City Square – leisure guests can look forward to a variety of shopping, dining and entertainment options at their doorstep or a quick stroll away, including the Angry Birds Activity Park located at the mall situated underneath the hotel. The hotel will also be connected to the Persada Johor International Convention Centre via the Persada Link Bridge covered skywalk, enabling corporate and MICE (Meetings, Incentives, Conferencing, Exhibitions) delegates to commute easily to the convention centre and downtown offices. “The state government is also investing in developing the downtown area into a tourism and business hub. These factors bode well for us, representing an excellent opportunity to bring the most recognised hotel brand in the world, Holiday Inn, to Johor Bahru,” he added. As one of the first hotels in Johor Bahru to offer internationally branded mid-scale accommodation, Holiday Inn Johor Bahru City Centre will be equipped with six meeting rooms, a business centre, as well as an outdoor pool and gym for guests to enjoy their downtime. It will also feature an all-day dining restaurant and a lounge offering the Holiday Inn brand’s signature Kids Stay and Eat Freeprogramme, where kids under the age of 12 can stay and dine for free – making it an ideal accommodation choice for family, leisure and business travellers alike. The owner, SKS Group, is one of Johor’s largest developers with a strong hotel portfolio that includes four upcoming hotels in Western Australia, as well as several existing and pipeline hotels in Johor Bahru and Desaru. The Holiday Inn brand enjoys a strong presence in the region with 23 hotels and resorts in South East Asia. In Malaysia, IHG has five hotels open across three brands: InterContinental® Hotels & Resorts, Holiday Inn® Hotels & Resorts, and Holiday Inn Express. The group plans to grow its presence by more than double in the next three to five years, with a further eight hotels in the country’s development pipeline. Book your Holiday Inn hotel in Johor Bahru Malaysia and around the world at best rates available. Pay at the hotel. Book now! IHG (InterContinental Hotels Group) [LON:IHG, NYSE:IHG (ADRs)] is a global organisation with a broad portfolio of hotel brands, including InterContinental® Hotels & Resorts, Kimpton® Hotels & Restaurants, Hotel Indigo®, EVEN® Hotels, HUALUXE® Hotels and Resorts, Crowne Plaza® Hotels & Resorts, Holiday Inn®, Holiday Inn Express®, Holiday Inn Club Vacations®, Holiday Inn Resort®, avid™ hotels, Staybridge Suites® and Candlewood Suites®. IHG franchises, leases, manages or owns nearly 5,300 hotels and more than 785,000 guest rooms in almost 100 countries, with more than 1,500 hotels in its development pipeline. IHG also manages IHG® Rewards Club, our global loyalty programme, which has more than 100 million enrolled members. About SKS Group: Founded in 1983, SKS Group is a multi-disciplinary organisation with core business that spans across property development, hospitality, investment holding and credit finance in Johor, Malaysia and Perth, Western Australia.